Three balls, 1 passes to 2, cuts towards 4 for a pass, 4 goes behind 6, 1 passes to 8 and follows the pass. 2 passes to 5, cuts towards 3 for a pass, 3 goes behind 9, 2 passes to 7 and follows the pass. Continue with 5 passing to 6 and cutting towards 8. 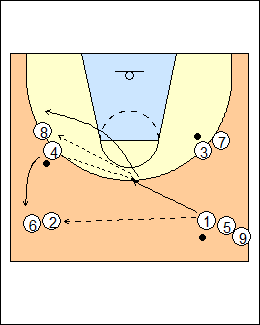 See Passing - Raytown (almost the same drill), 4-corner. Can use more balls. 1 passes to 2, cuts to the basket for a pass from 4 and finishes, 4 goes behind 6, 1 rebounds and goes behind 8. 2 passes to 5, cuts to the basket for pass from 3 and finishes, 3 goes behind 9, 2 rebounds and goes behind 7. 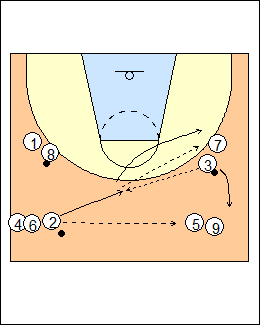 Continue with 5 passing to 6 and cutting to the basket for a pass from 8.